Bryan has lived in White Settlement, Texas, just a few miles away from MedStar’s headquarters, all his life. 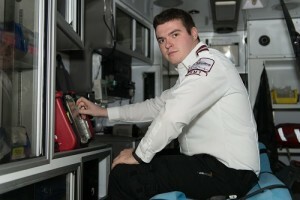 He is a volunteer with his hometown fire department and has been with MedStar for two years. MedStar was his first EMS position, and he plans on making EMS his life-long profession by attending paramedic school in the near future. When asked about what he likes most about EMS, Bryan is quick to highlight his desire to help people, and to make every interaction, with every patient, the best it can be—even at some of the most challenging moments in someone’s life. Bryan was selected for the Star of Life honor because of his incredible work ethic, dependability, commitment to excellence, and customer service. Bryan is very excited about his trip to Washington, D.C. for two major reasons; to meet other Stars from across the country, and because this will be his first ever trip to Washington. MedStar is proud to nominate Bryan Harrell as a 2016 American Ambulance Association Star of Life.